It’s funny how the same media outlets that attack President Trump for leading an assault on a free press are the same people that have applauded Facebook, Apple, YouTube, Spotify and a host of other social media sites for banning Infowars founder Alex Jones on Monday. Far-Left outlets like CNN led the charge to get rid of Jones and his controversial — and often conspiratorial — methods in commenting on the news. But, a recent Twitter poll revealed that the people disagree with the scrubbing of Jones from a large portion of social media. 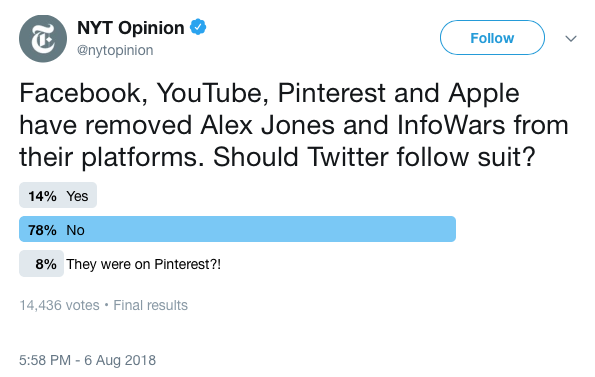 The New York Times Opinion Twitter page held a poll recently asking followers and anyone else who saw the poll to answer whether they think “Alex Jones and Infowars” should be removed from Twitter. As you can clearly see, a whopping 78 percent of respondents voted that they don’t believe Twitter should become a sheep and follow the rest of Silicon Valley’s assault on free speech. Although it could be said that 78 percent is kind of low considering Jones’ case is being looked at as a free speech issue. 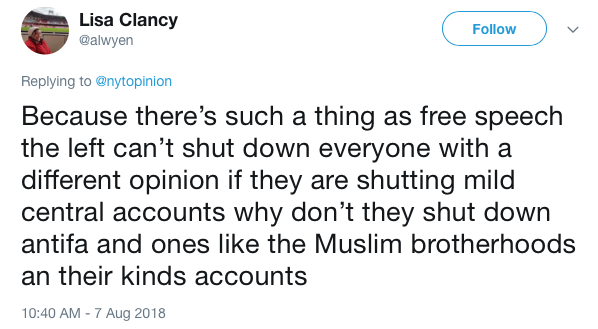 Whatever your opinion of Jones and the Infowars brand, it seems as though most agree with their right to free speech. Of course, there are those that say that these are private companies, so they can ban whomever they like. Sure, but the question remains: Where does it stop?